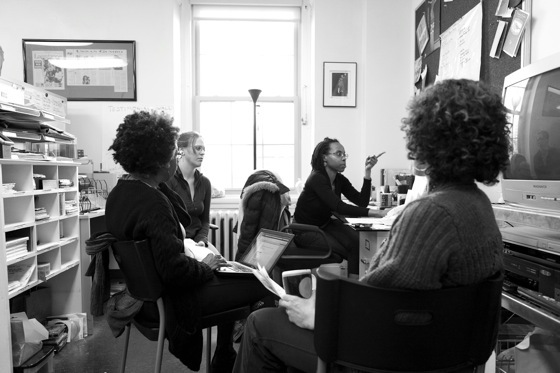 A.R.T./New York rents affordable office and rehearsal space in midtown Manhattan and Fort Greene, Brooklyn. One of the critical issues facing theatres today is the need for affordable office space. Without an appropriate office, it is difficult for companies to continue to grow, expand their artistic programming, effectively manage their time, and in some instances, hire a staff or find interns. In 2000, A.R.T./New York purchased its first shared space facility to help address this challenge. Today, A.R.T./New York’s two facilities offer a combined 42 offices available to member companies for rent. Located in Fort Greene (near downtown Brooklyn and BAM), the LuEsther T. Mertz South Oxford Space is a five story, 19,200 square foot Federal Style building that provides office space to 20 small and mid-size theatre companies for below-market rate, and subsidizes utilities and storage space. 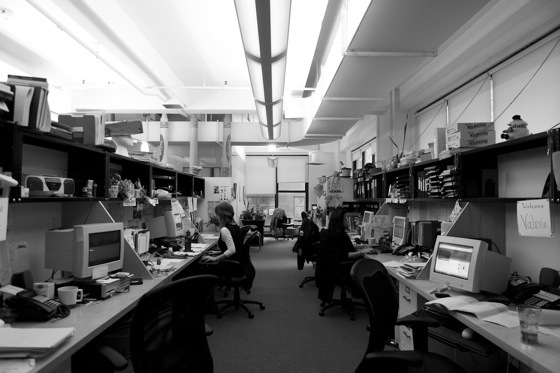 In addition to individual offices, the building has a variety of shared facilities and amenities such as rehearsal studios, a kitchen, and a mail room. The LuEsther T. Mertz South Oxford Space also plays an important part in the Fort Greene community. The intimate Gallery Three displays the work of local visual artists and the beautiful second floor Great Room is used for small-scale concerts, dance and theatrical presentations, and for community meetings. The LuEsther T. Mertz South Oxford Space is fully occupied at this time. Please email [email protected] if you would like to be placed on our waiting list to rent office space. Mailbox rentals are currently available. In 2002, A.R.T./New York signed a 20-year lease on 32,000 square feet in Manhattan’s Garment District. Originally acquired as raw open space, work was quickly undertaken to build out the entire third floor to accommodate offices ranging in size from 100 to 5,000 square feet and a variety of rehearsal studios. [email protected] is occupied by 22 companies with access to amenities such as a copier, pantry, and storage space. Full Company offices at [email protected] are fully occupied at this time. Please email [email protected] if you would like to be placed on our waiting list to rent office space. Mailbox rentals are currently available. Shared office space at [email protected] will become available in late summer 2017! A.R.T./New York members will now have the option of renting a dedication workstation in a shared office on either a short-term or long term basis. The Alliance of Resident Theatres/New York, ArtsConnection, Dreamland Theater, Fault Line Theatre, Gingold Theatrical Group, Keen Company, Ma-Yi Theater Company, National Alliance for Musical Theatre, National Asian American Theatre Company, National Guild for Community Arts Education, New Georges/The Room, Origin Theatre Company, Pan Asian Repertory Theatre, Playwrights Realm, Prospect Theater Company, SITI Company, Tectonic Theater Project, Transport Group Theatre Company, Working Theater. A.R.T./New York offers Mailbox Rentals at both facilities for member companies without a permanent address. For a $25 monthly fee, participating members have a mailbox, use of the copier (usage is billed monthly,) and a place to receive packages. Contracts are renewed on a yearly basis. Header: NAATCO's production of Henry VI. Photo by William P. Steele.